It all started with a novel called Remember Wake. Teresa was working for a PBS series and was sent out to interview a man named Clint Haakonstad to see if he should be featured in the series. Teresa was so moved and inspired by Clint's story of survival--first in the Battle of Wake Island and then during four years of internment in Japanese prison camps--that she decided to write a novel based on his story. And in that novel, she set out to do something no one had done before, to tell what happened to the women left alone on the home-front when the men were taken prisoner. The book was a labor of love that took ten years to complete and publish. While researching Remember Wake, Teresa became interested in learning more about daily life for women in the World War II era. Not statistics about how many women entered the workforce or how many served in the military, but real stories of what it FELT like to be a woman during the single greatest event in world history. Dancing in Combat Boots: and Other Stories of American Women in WWII tells eleven fictional stories based on real women that Teresa interviewed. It is now her most popular book. 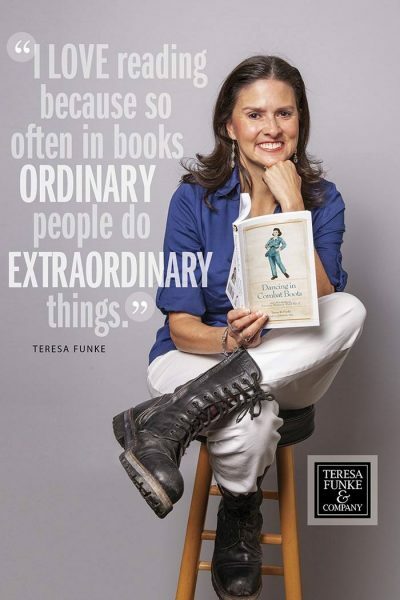 After completing her two books for adults, Teresa began to receive invitations to speak to schoolchildren about writing and World War II. She quickly realized that most elementary children today know nothing about that time period. Most have never even heard of Adolph Hitler or Pearl Harbor! But when Teresa speaks to them about the war, students sometimes opt to skip recess in order to hear more. It was the children who suggested that Teresa write some stories for them, and she was happy to comply. The Home-Front Heroes series features five distinct characters in five books. The characters represent different cultural groups in our country so readers can learn how the war was experienced in our diverse nation. Like all of Teresa's books, the Home-Front Heroes novels are loosely based on interviews with real people who serve as models for the characters. The first book, Doing My Part, features with a young girl working in a war factory. The second, The No-No Boys, tells the story of Japanese-American internment. The third, V for Victory, features a Mexican-American boy helping in the family store in San Antonio. The fourth, Wave Me Good-bye, is about a Jewish girl living in the Bronx who befriends an English evacuee. The fifth, War on a Sunday Morning, tells the story of a navy officer's daughter who watches the attack on Pearl Harbor from her front yard. Before writing her books, Teresa wrote articles for local, regional, and national magazines and newspapers, did some commercial writing, and also published several standalone short stories and personal essays in literary and commercial magazines. Two of her essays were listed as Notable Essays by the prestigious Best American Essays series. Teresa continues to write short stories, essays, poems, and her popular inspirational blog, "Bursts of Brilliance for a Creative Life." She is also working on turning some of her children's books into plays for young audiences.